We launched the China BioPharma ETF (Nasdaq: CHNA) in 2018 with the goal of trying to help investors gain exposure to the important shift to innovation that is happening in China’s biopharmaceutical industry today. One company that recognized this shift early and symbolizes the country’s move to innovation is China Grand Pharmaceutical and Healthcare Holdings Limited. View all holdings of the CHNA ETF. Years ago, China Grand’s business model was simply to manufacture pharmaceutical ingredients and raw materials because this was in line with China’s drug sector back then. However, under the leadership of CEO Dr. Shao Yan (who also goes by Rocky), the company has been transitioning to a more dynamic model of bringing innovative products into the country. This was made most apparent in 2018 when, along with a private equity partner, China Grand acquired Sirtex Medical, the maker of an innovative liver cancer treatment, for $1.4 billion USD. 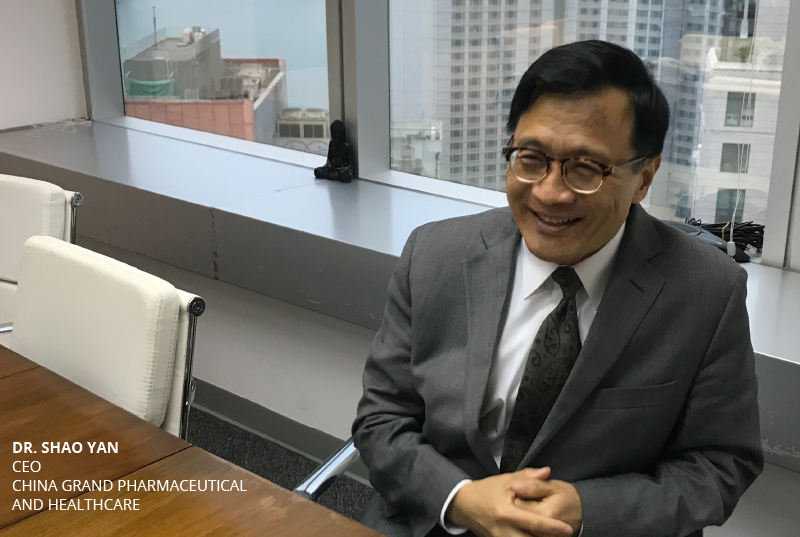 We caught up with Dr. Shao in April at the company’s executive offices in Hong Kong and discussed with him China Grand’s past, present, and future given this era of change that is happening in China today. Below is a transcript of our interview, which has been minimally edited for clarity. CHNA ETF: Thank you for hosting us in Hong Kong today. First, can you please introduce yourself and tell us about your background. Dr. Shao: I am Rocky Shao, the CEO of China Grand Pharmaceutical and Healthcare Holdings Limited. I have been here since 2008, reaching my 11th year. My background was that I received my bachelor degree in telecommunications and MBA (Masters in Business Administration) from Peking University. Then I also received a Ph.D. from Beijing Normal University. I received my education in China but I have also traveled frequently. During my early career, I worked for the Ministry of Radio, Film, and Television in the Department of Telecommunications Management for many years. After I received my MBA from Peking University, I changed from telecommunications to the financial services industry. I was working for one of the largest state owned securities firms called China Southern Securities. I was sent to Hong Kong to set up a branch here. That was about 20 years ago. Through that, I made contacts with local investors and learned the investing field. I also learned the operations of private equity and venture capital investing in both the telecommunications (TMT) and pharmaceutical industries. Why pharmaceuticals? My parents are both medical doctors and I was educated from a very young age about this field. That is why the major shareholder of China Grand Enterprises, Mr. Hu, invited me to operate this company when they were looking for new leadership in strategic development and financial activities. Back then China Grand was focused entirely on manufacturing and they did not have a lot of experience with international capital market operations, overseas mergers and acquisitions for innovative products, or assets and the regulatory component. That is why I was asked to join as CEO in 2008. CHNA ETF: Can you tell us more about what the company was like back then? What kind of pharmaceutical and healthcare products was it already making and selling when you became the CEO? Dr. Shao: 11 years ago the company was transitioned from being state owned to private. Today it is 99.84% private and back then it was about 75% when we took it over. We changed it from being a state owned enterprise into a more dynamic private company. The old company was focused on manufacturing pharmaceutical raw materials. 80% of revenue came from making active pharmaceutical ingredients (APIs). When we took over, we relayed to the team that we wanted to move towards having more products in ophthalmology (eye related) and cardiology. We already had two or three small products in ophthalmology and also cardiovascular emergency use medicines and we wanted to expand the product portfolio of these treatment areas through research and development (R&D) and mergers and acquisitions (M&A). Last year, for the very first time, we expanded our footprint to a new area, cancer. CHNA ETF: What does China Grand look like from an operational standpoint today compared to back then? Dr. Shao: Yes, compared to 11 years ago the size and expertise of the company is quite different from today. In terms of revenue, it was $200 million HKD (approximately $25.5 million USD) back then and earlier we just announced $6 billion HKD (approximately $760 million USD) for 2018. This is about 30 times larger today. In terms of the structure, I mentioned that 11 years ago 80% of revenue came from manufacturing APIs. Today more than 60% of revenue comes from finished pharmaceuticals and medical devices. These are higher profit margin products. CHNA ETF: You mentioned that you are getting into the cancer care business. In 2018 China Grand and a private equity partner called CDH Genentech co-acquired an Australian firm called Sirtex Medical. Sirtex has a liver cancer treatment that uses Selective Internal Radiation Therapy (SIRT) in resin microspheres. How much did you spend on the acquisition and why was it an appealing target for you? Why did you want to get into oncology like this? Dr. Shao: Sirtex was a publicly-listed company and we paid $1.4 billion USD to acquire it, excluding transaction and banking fees. Why did we want to get into this new area? CDH is our second largest shareholder and it is one of the largest private funds in China. They have done a lot of cross-border deals in the past with Chinese partners. They like to make investments together with industrial partners to bring new technologies and products into China. They brought us this opportunity and we decided to go together with them because the liver cancer area has great potential for two major reasons. First, liver cancer is a big issue for the Chinese population and we have about 55% of global cases here. It is a deadly disease of course. In China the diagnosis of this is not perfect so about 75% are caught at a later stage unfortunately. This is an opportunity for us to bring better treatments. Second, this is very suitable product that has already been proven. It has already been commercialized in international markets for about 10 years. Today approximately 80% of the revenue comes from the United States and the headquarters is in Boston. Being a listed company, we do not want to take too much risk when we go into a new area and we view this as a proven product. This is a radiology treatment. If we successfully land in China, we can be a leader in it. It is an area with great potential, a good technology, and we know the Chinese market much better and are doing this with good partners. That is why we decided to go for it. CHNA ETF: So with 80% of the current revenue coming from the United States, now you have a sizable business there. Dr. Shao: Yes. In fact, earlier this month we passed the CFIUS (Committee on Foreign Investments in the United States) review. This is required when foreign investors acquire something that has any operations in the United States. Ours is the first large case of an approval since new laws were introduced that paved the way for us to operate such a sizable business in a developed market like the United States. CHNA ETF: Can you describe what the process was like? When did you apply and how many months did it take for the approval? Dr. Shao: We signed the Scheme Implementation Deed with the Sirtex shareholders and completed the acquisition in September, 2018. Prior to the completion, we made a voluntary notice to CFIUS in July saying that we would like to do the acquisition. We described who we are and who our partner CDH is and the background on why we would like to do the deal. We asked CFIUS if they would allow us to co-operate the U.S. business. We made suggestions about how we can ensure patient data security and also handling the supply chain of nuclear materials since this is a radiology treatment. We thought we could receive the final certification by the end of last year, however, the shutdown of U.S. government delayed for a while, and finally we received the final clearance in March this year, so it took us about eight months. I think the key to consider is that this is a product that serves patients in urgent need. Also, we are a public-listed company and we do not have any major Chinese government interest or shareholding. Our partner CDH also previously passed a CFIUS review about three years ago when they acquired a food company. So there was familiarity with them while this was our first time. CHNA ETF: So now you are in cancer for the first time. Do you think cancer is an area where you will make more investments and grow your number of products? Is this an area where you want to increase your presence? Dr. Shao: Of course cancer is a big problem in the world and especially in China. The Chinese regulators are implementing many preferential policies to bring new technologies and medicines into the country. This is a good opportunity. We are listed on the Mainboard of the Hong Kong Stock Exchange and are in a good position to explore more products overseas by investment and acquisition. Before the Sirtex acquisition we did another transaction with a different partner called CDB-PE Fund to acquire a German company that makes innovative drug-coated balloon products. This was about four years ago and was my first experience doing that type of deal. Sirtex is the biggest one by far. We do need many new products for cancer in China. The Chinese government is open to having medical insurance cover these new technologies with proven therapeutic effect. This is also an opportunity. The cost of new innovative medical devices and medicines is higher but the government is willing to subsidize them. CHNA ETF: What is the path to getting the Sirtex treatment approved and reimbursed on the national list in China? Dr. Shao: The first step is to get the registration approval for commercialization. We are talking with the National Medical Products Administration (NMPA, formerly called the CFDA) about that. Afterwards, the insurance reimbursement will determine if they think it is cost effective. I think 80% or more of the cancer related products that have been brought into China are covered by insurance. So this is good news. This is a well-developed product. Three or four years ago if we were trying to bring a new product into China, we would be required to spend 3 to 5 years for local clinical trials. Now new policies are in place that quicken the process. It is understood better that with a well-developed product with sufficient amount of clinical trial data around the globe, we might be able to submit them to National Medical Products Administration (NMPA) for registration in China. For Sirtex, we are seeking opportunities to access a green channel for providing existing clinical trial records of the Asian population to get the approval sooner to serve this unmet need in the nation. CHNA ETF: That covers the topic of cancer. Are there any other products you sell today that you would like to highlight that are a value driver or focus of your company? Dr. Shao: As I said earlier, we already had two major treatment areas. One is ophthalmology. We are the largest local manufacturer in China for ophthalmology products. In terms of revenue, we are on the same level as Alcon in China. Our brand is called Everyday Bright Eye. 80% of it is prescribed and the rest is sold over the counter. 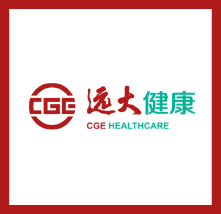 It is often recognized as the first local brand choice for doctors in China. Our second area is cardiovascular. We focus on emergency use injections in the emergency room and we are the leading company in China for this field too. We acquired a German company Cardionovum GmbH that makes drug-coated balloons. It took us three years to complete the China local clinical trials and we will soon launch three products covering five indications from Cardionovum in China. That will be a new area where we are bringing German made products into China. CHNA ETF: You have been running this company over a decade. How would you describe the changes you have seen to the healthcare sector in China over that time? Where do you see the future going forward? Dr. Shao: China is not a developed country…it is a developing country. A decade ago when I joined the company, raw materials and generic products were the trend in China. Price was an advantage but not the quality of new products. Today there are more than 4,000 pharmaceutical manufacturers in China, some of them are in very small scale. We are ranked at 34th on the national list of the pharmaceutical industry. We also have transitioned from generic products, going forward to the advanced and innovative products developed by ourselves and imported. This is a change for our company but I think also for the pharmaceutical market in general in China. Today China has a centralized procurement program called “the 4+7 pilot city program” that has significantly lowered the prices of generic drugs and made the market for those drugs very competitive. Our senior management had the insight that the company should shift from generic drugs to exclusive and innovative drugs around four to five years ago. That is why we did the German acquisition and the Sirtex deal, so it is a big change. CHNA ETF: How much of a focus is your own research and development (R&D)? Are you making a lot of investments into discovering and developing new drugs of your own? Dr. Shao: Four or five years ago we shifted to 100% local R&D. It means we focus on doing category 3 or category 6 clinical trials and registration in China. Category 3 means the medicine has already launched in other regions but is not yet available in China, like some orphan drugs, for example. We would be the first-to-launch player in China. Later some products were category 6. That means the products were injections but we would like to make a pill formulation, for example. We have 100 scientists and staff in our research team who focus on this type of R&D work. At the moment, we are still not yet capable of hiring 1,000 Ph.D.’s and having a big domestic lab to start with fundamental scientific research so we are currently putting our strategic emphases more on bringing in innovative products from overseas either by acquisition or to partner with foreign companies where we bring their products into China and run any clinical trials if necessary and commercialize them. CHNA ETF: You are well known in China, but our audience in the United States and around the world might be learning about China Grand for the first time. What is a core message that you would like those people to know about what your company is and what your future goals are? Dr. Shao: Yes, we are Chinese based pharmaceutical company with 80% of revenue derived from China’s domestic market, one of the market leaders in ophthalmology, cardio-cerebral emergency use and radiology cancer therapy medical products in China, and we have a proven revenue growth record and tactical experiences in overseas innovative medicine development. The message we would like to bring to foreign investors is China Grand Pharm is a symbol not only synchronized with the development trend of China’s pharmaceutical industry, we actively grasp opportunities to move forward to a very modern, innovative, technology-driven company, and we are entering into a new era where China is facing changes in its medical industry where innovative therapies and products can be more appreciated, and the quality of products and branding are essential to anyone in the market. CHNA ETF: Thank you for your time and for allowing us to visit you here in Hong Kong. The China BioPharma ETF is a holder of China Grand and we wish you the highest success. Dr. Shao: It is my pleasure. Thank you. Thank you for your interest in the China BioPharma ETF. Please be sure to sign up for email alerts below if you would like to receive notification of news, company interviews, and research that we publish from time to time. Opinions expressed are those of the author, or Funds and are subject to change, are not intended to be a forecast of future events, a guarantee of future results, nor investment advice. Fund holdings and allocations are subject to change at any time and should not be considered a recommendation to buy or sell any security. Alcon, CDB-PE Fund, and CDH Genentech are not a holding of the Fund or affiliated with the Fund.